2pcs 8GB PC3-12800 CL11 1600MHz NON ECC Module 240PIN DIMM NON REGISTER. This computer can use DDR3-12800 running at 1600Mhz as well. 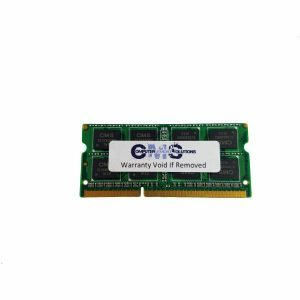 Lifetime Warranty 30 Day Money Back Guarantee We don’t use Generic or OEM Parts to avoid incompatibility specially in HP systems. Manufactured by Computer Memory Solutions A 64-bit operating system is required to utilize more than 4GB of memory. Max Memory: 32 GB Expansion 4 Sockets Compatible with: HP ENVY Desktop h8-1540t, HP Envy Phoenix Desktop 800-050se MODULES MAY BE INSTALLED ONE AT A TIME; however, they must be added in like pairs to take advantage of dual-channel support. If 4GB is installed, the recognized memory may be reduced to 3.5GB or less (depending on system configuration and memory allocation). Maximum configurations require a 64-bit operating system.